“We are delighted to form this educational partnership with K’NEX,” said Joe Cytacki, Vice President, Life Sciences and Exhibits at the MODS. “What better way to engage kids to learn about math and science than through creative and innovative play. What is the angular velocity of the Blender Ride as it spins about the center post? This is just one of many questions that the Museum of Discovery and Science in Fort Lauderdale, Florida is answering in K’NEX: Building Thrill Rides, a special exhibit that captivates young visitors and provides them the opportunity to explore the science, math and technology behind hair-raising amusement park thrill rides. Joining forces with the Museum of Discovery and Science, K’NEX Brands, the only U.S. construction toy company focused on Building Worlds Kids Love™, is displaying models made solely from K’NEX rods and connectors. The models range from a roller coaster measuring over 10 feet tall, to a 6 foot Ferris wheel, and a variety of swing rides from 3-10 feet. The realistic actions of the models bring scientific and engineering concepts to life for students, who can conduct simple experiments to explore physical forces such as potential and kinetic energy, and linear and rotational motion. In addition to the exhibit, the Museum of Discovery and Science provides hands-on activities and K’NEX building areas for children ages 6 and up and KID K’NEX for youngsters ages 3-5. Happily, children don’t have to leave their on-site creations behind – instead, they can purchase their designs, with pricing based on a Weigh & Pay model (weight of total parts used at a predetermined price). The Museum’s Explore Store also has K’NEX sets on sale for aspiring young engineers and architects. The relationship with the Museum of Discovery and Science evolved from K’NEX’s past and successful traveling exhibit program that offers a fun, interactive exhibit that creates a hands-on K’NEX environment for kids and their parents. The K’NEX: Building Thrill Rides will be at the Museum of Discover and Science in Fort Lauderdale, Florida through May 6, 2012. For more information about the exhibit, please visit http://www.mods.org. 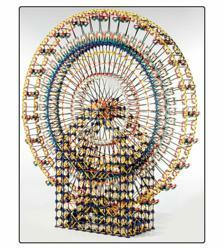 To learn about K’NEX Brands and the company’s thrill ride exhibit, please visit http://www.knexexhibits.com.